In the book of Genesis the dimensions of Noah’s Ark are given as 300 cubits long, 50 cubits wide and 30 cubits high, but Toneelhuis/FC Bergman’s 300 el x 50 el x 30 el, presented as part of the 2018 London International Mime Festival, has left biblical history to the imagination and focuses instead on the current environmental and political crises facing Western society. Not that there is any sense of impending doom in the opening scene of a fisherman by a pond in sedentary contemplation and endless cigarette smoke. On any one of three screens, however, we see an old man (Paul Kuijer) lying in bed in a small wooden hut, an incarnation perhaps of Noah himself. As the black scrim rises to reveal a community of six ramshackle huts tottering around the perimeter of a leaf-covered clearing, we watch Kuijer unstick the monitors on his chest, pick up a hammer and plod outside into the clearing where cinematic space and theatrical space merge for the first time. 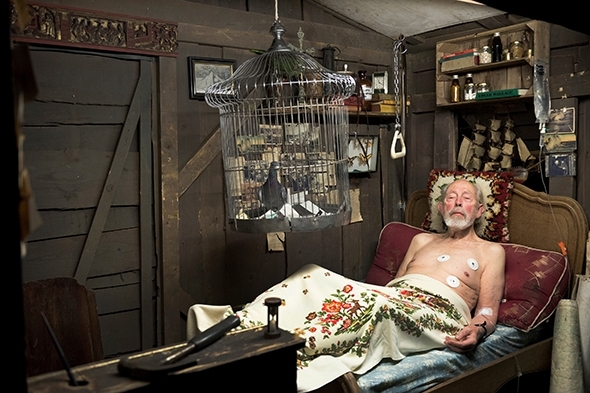 Kuijer disappears into the pine forest to build his ark — we hear his hammer blows — while a camera and crew travel continuously around the community staring into the back of each hut long enough at each pass to reveal, with mordant exaggeration, successive tableaux vivants of unfolding domestic dramas. Lingering on the surreal, these portraits of ‘ordinary madness’ are a reflection — and there is no shortage of reflection in this allegory of the Ark — of such contemporary malaises as insatiability, depression, sexual dysfunction, escapism and estrangement. The seamlessly integrated live screening makes members of the audience voyeurs in a community that is, like the show itself, a product of our own making; we are peering ineluctably into our own lives. So entrenched is the sense of habit and gnawing oppression that the only way out is an act of rebellion. We learn the secret of the young woman at the piano who sneaks across the clearing to play war games with her lover. They plan their escape using the map on his hut wall and attempt to leave with their suitcases commando-like across the clearing. The small community, however, is sensitive to any danger to its hermetic boundaries and emerges into the clearing to close ranks around the lovers, punishing the young man by forcing him back to his hut and nailing it shut. The accompaniment of Vivaldi’s Winter from The Four Seasons adds an additional chill to the staging and yet there is a certain comfort in the music, a recognition of a familiar composition that exists only for the ears of the audience watching from a distance. But how far away are we and where does Toneelhuis/FC Bergman place us in relation to the unfolding narrative? If the story of Noah’s Ark alluded to in the title can be used as a clue for interpretation, one can read 300 el x 50 el x 30 el in light of current European political events (even though it was created well before Brexit, in 2011). The small insular community becomes a metaphor for tightening border controls while the mood of suspicion and isolation reflects a right-wing xenophobic mentality brooding with violence. Over the course of the performance the voyeurism of the camera subtly turns to vigilance and surveillance as the rhythm of filming matches the unfolding moral tale. The event that brings the community together is the death of the young man, who blows himself up with his stash of gunpowder fuses. The fisherman, moving off his seat for the first time, initiates an act of penitence by immersing his head repeatedly in the pond; other characters emerge slowly from their huts with buckets of water and join in the ritual. Nina Simone’s Sinner Man provides the mood and rhythm of a simple, redemptive dance in which the entire community participates. Of course the flood is still on its way; these are intimations of disaster, not the disaster itself and penitence is the beginning not the end. Toneelhuis/FC Bergman suggests that if redemption is at all possible in the sense of a desire to heal society’s current ills it cannot be achieved through such rituals of seclusion, but rather by the opposite, by opening hearts and minds to ‘others’, to the establishment of a common humanity. The last-minute emergence into the clearing of an entire village of ‘outsiders’, let in by one of the young women, suggests such a change to the social and political equilibrium. Today’s hope, in other words, is an ethic of inclusion.